An ad against Sen. Jon Tester in Montana accuses him of favoring “government-run health care” — for seniors. This is an amusing and nonsensical claim, given that Medicare is a “government-run” health insurance program for those over age 65 — including the seemingly grief-stricken woman who is pictured in the ad. Medicare is actually among the most popular of all federal government services. So what is the Chamber ad talking about? On screen are a series of citations that — when deciphered — turn out to refer to the new health care law that was passed last year. Tester voted for it, and Republicans vow to repeal it if they get the chance, constantly denouncing it as a “government takeover” of health care in general. But as we’ve pointed out any number of times previously, that is not true. The new law does expand existing programs, and it establishes new subsidies and imposes additional regulation of health insurance companies. But it doesn’t come close to establishing a government-run system like those of Britain or Canada. Many liberals were in fact disappointed when the law failed to include a government-run “public option” to private health insurance. For evidence of how far off base this “government-run” claim really is, take note that government already accounted for 43.6 percent of all health care spending in 2009, before the new law was enacted and before any of its provisions could have any effect, according to data from the Centers for Medicare and Medicaid Services (see table 16). Furthermore, that projected increase isn’t all due to the new law; CMS also cites “robust Medicare enrollment growth” as the baby-boom generation reaches age 65. Even by year 2020, less than half of all expenditures (49.2 percent) will be paid by government. The ad goes on to state that Tester favored “billions in Medicare cuts to fund ‘Obamacare.’ ” It’s true that the new law calls for $555 billion in Medicare cuts over 10 years. But as we pointed out when this whopper showed up in similar ads in 2010, that’s a reduction in the growth of future spending, not a slashing of the current Medicare budget or benefits. In fact, the law includes improved benefits for prescription drugs, and there are no cuts in benefits for those on traditional Medicare (though reduced subsidies for Medicare Advantage plans will likely lead to less generous benefits under those private plans, which cover about one in four seniors). The anti-Tester ad also accuses him of favoring “rising health insurance costs” for small businesses and the “fear” of “high unemployment” for families. “Rising Health Insurance Costs.” There’s some but not a lot of truth to this charge. It’s true that the new law has pushed up premiums for some health insurance plans, particularly the bare-bones plans offered by many small businesses, which must now provide more generous benefits. For example, plans must now cover adult children up to age 26. And it’s true that employer-sponsored premiums jumped painfully last year, by 9 percent, according to the Kaiser Family Foundation. But it is also true, as we noted recently, that the increase due to the health care law was only about 1 percent to 3 percent, according to independent experts. Most of the increase came from rising medical costs, as usual. Plus, the law offers tax credits to defray the insurance costs of some small businesses. “High Unemployment.” Here the announcer is pretty vague; her exact words are: “For families, the fear of higher energy taxes, high unemployment.” This one is a real stretch. The ad cites no actual votes in favor of higher energy taxes. And Montana’s unemployment rate is actually well below the national average. Again there’s a bit of truth here: The on-screen graphics cite Tester’s votes in favor of proceeding with a 2008 bill to limit emissions of greenhouse gasses, a vote this year against a Republican measure to ban EPA from addressing climate change, and a third vote way back in 2007 against a highly technical amendment that, according to its sponsor, would “make it harder for [the Senate] to enact legislation that increases the price of gasoline.” (That one failed 55 to 37). None of those votes involved taxes, but all might have produced upward pressure on energy prices nonetheless. Do those votes strike “fear” of high unemployment in the hearts of Montana voters? We’ll leave that for them to decide. The fact is, the state’s jobless rate was 7.7 percent as of September, according to the most recent data from the Bureau of Labor Statistics. And while that’s higher than is generally considered to be acceptable, it’s still lower than the national average of 9 percent. Another problematic ad is running in Ohio, targeting Democratic Sen. Sherrod Brown. The ad accuses Brown of fostering higher energy costs. It states: “Brown voted to block American energy production, and increase energy taxes.” This one is on firmer ground than the strained attack on Montana’s Sen. Tester, but it’s still debatable. These claims rest on two Senate votes from May. Brown voted against a Republican-sponsored measure to expand drilling on the Outer Continental Shelf. But that wasn’t a vote to “block” domestic production, which is actually booming. 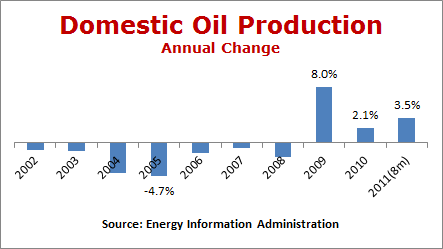 Domestic oil production — after more than two decades of decline — jumped more than 10 percent in the last two years, and is already up another 3.5 percent in the first eight months of 2011, compared with the same period last year. So while Brown’s vote might have slowed the future progress of the drilling boom by keeping certain offshore areas off-limits, the plain fact is that American energy production is far from being blocked. The other vote cited by the anti-Brown ad is one he cast to remove special tax preferences enjoyed by the oil industry. That would indeed lead to higher taxes on energy companies, but would it amount to higher taxes “on energy,” as the ad claims? That’s debatable, to say the least. Economists generally say no. Standard economic theory holds that companies always try to charge the highest prices the market will bear, and cannot simply pass along their increased costs at will. So raising taxes on an oil company is not the same as charging higher fuel taxes at the pump. Many, if not most, economists, including those at the nonpartisan Congressional Budget Office and the U.S. Treasury, figure that changes in corporate taxes are borne mainly by stockholders, in the form of reduced dividends and capital gains. But others, including Republican economist Gregory Mankiw, argue that higher corporate taxes eventually reduce investment, ultimately leading to lower wages for workers and higher prices for customers. Either way, it would be more accurate for the ad to accuse Brown of voting for “higher corporate taxes.” The effect on energy prices — if any — would be indirect.